On 12 February 2018 we drove our Chevy Bolt to Grover Beach from Bakersfield, California, a distance of nearly 150 miles. I'd been anticipating this drive for several months. It was a first for us to drive directly from Bakersfield to Grover Beach in an electric vehicle (EV). We've driven to the coast several times before in our Leaf, but the Leaf's limited range necessitated a circuitous route that added 100 miles to the trip and many hours of charging en route. The road we chose, Hwy 166, is scenic and often with very little traffic. There's absolutely no place to charge on this route, not even at an RV park. The Leaf wouldn't have made the grade outside Maricopa climbing the Temblor Range before going turtle. As in my trip to LAX in the Bolt, the trip was uneventful. The seats, while not comfortable, didn't bother us on the 2-1/2 hour trip. We arrived at our destination, the Kon Tiki Inn, in Pismo Beach with 105 miles of range remaining. The Kon Tiki is an EV-friendly, moderately-priced private hotel overlooking the beach. They have ports for Tesla, J1772, and NEMA 14-50. They also have installed a ChargePoint 24 kW DCFC station for public use. If you identify your car as an EV when checking in, they ask if you want to charge. If you do, they mark off a parking space for your use. Parking is at a premium in the area and this courtesy gives you assurance you'll have a place to charge overnight. Charging at 240 V is free for customers. Though the trip was as uneventful as the others we've taken in the Bolt, it did put me on edge. What disturbed me was that my estimates of consumption for both the trip going and coming were way off. 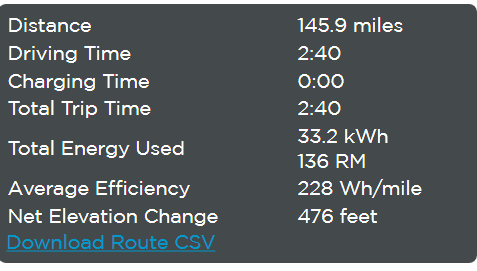 We arrived in Pismo Beach (Grover Beach) after consuming 35.7 kWh for a mileage of 4.1 kWh per mile. We consumed almost 20% more electricity than I had estimated with EV Trip Planner. On the return trip, I was off by almost 25%. If you allow 20% of the traction battery as a reserve and you are off by 20%, you could find yourself calling a tow truck. That kind of uncertainty can lead to range anxiety even in a car with a 60 kWh battery pack. I anticipate some future trips at the edge of the Bolt's range. Not knowing how far I can get on a charge makes those trips problematic. 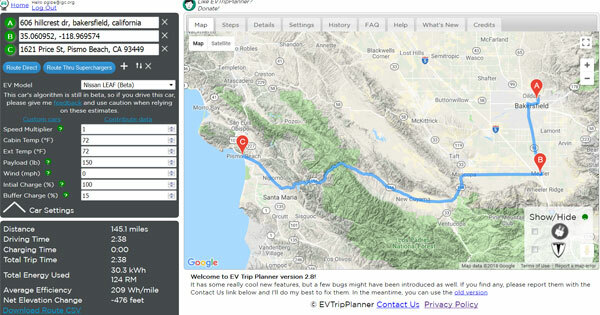 Compounding my unease was that I had switched from using the drop down for the "Leaf Alpha" in EV Trip Planner to "Leaf Beta" after my trip to LAX indicated that the alpha version was too conservative. There is no drop down for the Bolt. Ben Hannel, the designer of the web site, is a student at Stanford University and hasn't updated the web site with the Bolt. If I had used the Leaf Alpha drop down, EV Trip Planner would over estimate consumption from 6% to 13%. If I am going to use an estimator, I'd prefer that it would slightly overestimate consumption than significantly underestimate the amount of electricity I would need. The route from Bakersfield requires a steep ascent of about 2,700 feet from the San Joaquin Valley to cross the Temblor range then a long gradual drop to sea level on the coast. According to tests by Tony Williams, a Nissan Leaf would require about 3 kWh to summit the Temblors or about 10% of total trip consumption in either direction. I have a query in to Ben about how his web site incorporates various factors, such as temperature and the difference between Leaf Alpha and Leaf Beta. In trying to explain the discrepancy in the estimates, I played with the estimator. I varied weight, outside temperature, and wind speed. I used the estimator's defaults for cargo weight and temperature. It was 55°F during the trip. The estimator increases consumption by 7% from the default setting of 72°F. I don't know if this is for cabin heat or not. We didn't use cabin heat, so I used the default setting. The default setting for the payload is 150 pounds. Doubling the payload only increases consumption 1% so this wasn't significant either. However, wind resistance is a significant factor in a vehicle's energy consumption. The estimator returns an increase in consumption of about 15% when driving into a headwind of 5 mph. When driving into a headwind of 10 mph the estimator returns an increase in consumption of about 20%. There was a good headwind on the return trip to Bakersfield, but I didn't stop to get a sense of it. My wife had an appointment to keep. It was strong enough to bend the grass on the long stretch through the Temblors. 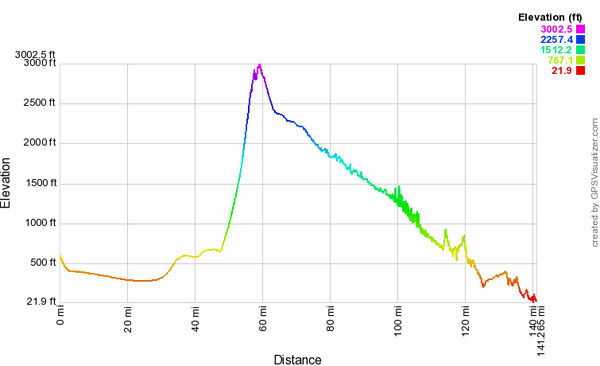 A head wind in either direction could explain the discrepancy. Unfortunately, I just don't know the answer. Until I do, I plan to err on the conservative side. Interestingly, while logging onto PlugShare I saw that a friend had just checked in with a Bolt in Morro Bay. They'd purchased a Bolt about the same time we did. They only use the Bolt for trips around town, but thought they'd take it on a road trip to the coast as we had done. They simply looked at the range estimate on the Bolt's display, looked at the distance to Morro Bay--about the same distance as to Grover Beach--and thought they had enough range. They did. They arrived with 90 miles remaining, charged at a Level 2 station and eventually made it back to Bakersfield with equanimity. As my friends showed, you can drive the Bolt on trips of 150 miles and not fret about it. That's nearly three times the working range of our 2015 Nissan Leaf. In the Bolt, you can simply enjoy the ride.